Mohamed Salah got the only goal as leaders Liverpool got their Premier League title bid back on track at Brighton. Salah's 51st-minute penalty proved the difference, taking Jurgen Klopp's Reds to a hard-earned 1-0 triumph over Albion in front of a record 30,682 Amex crowd. Liverpool came into it on the back of a first Premier League defeat of the season at Manchester City last time out and were well below their best against Chris Hughton's men. Albion were comfortable for large parts but midfielder Pascal Gross's foul on Salah proved decisive, with Reds' leading scorer firing home the resulting penalty. Kloop's men went seven points clear at the top with the win, while Brighton stay 13th. 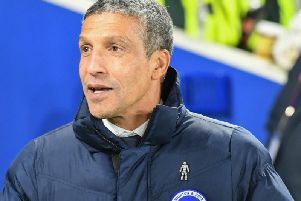 Brighton made one change from the side that drew 2-2 at West Ham in their last Premier League outing as full-back Gaetan Bong came in for the injured Bernardo. Brazilian Fabinho started as a centre-back for Liverpool while Xherdan Shaqiri also came in - the pair replacing injured Dejan Lovren and James Milner as the visitors made two changes from the team that tasted a first league defeat at Manchester City. Jurgen Kloop's troops were looking to respond after successive defeats at City and Wolves - in the FA Cup - and they fashioned the first opportunity on nine minutes. Makeshift centre-half Fabinho's raking pass picked out Scotland international Andy Robertson. The left-back then fizzed in a cross which just evaded frontman Roberto Firmino. Albion looked comfortable in the opening exchanges, seeing a similar amount of the ball as Liverpool. And striker Glenn Murray should have done better with a header after 16 minutes. German Pascal Gross' cross found the forward, who had worked some room in the area, but he headed well over from ten yards. The full-backs were Liverpool's best outlet in the opening half-hour, with Shaqiri this time going close following great work from Trent Alexander-Arnold. England international Alexander-Arnold cut back on to his left-foot before delivering a pinpoint cross, although Shaqiri's glancing header went inches wide on 26 minutes. All of Brighton's good work in the opening 50 minutes was undone when Liverpool were awarded a penalty. Salah turned Gross too easily then the German brought down the Reds' leading scorer, with referee Kevin Friend pointing to the spot. Goalkeeper David Button dived the right way but Egyptian Salah powered the penalty home. Albion regrouped after going behind, coming close to grabbing a leveller after 57 minutes. Former Barcelona defender Martin Montoya pulled back for an unmarked Gross, only for his goalbound effort to be brilliantly blocked by Fabinho. Liverpool continued to probe for a killer second and nearly had it ten minutes from time. A fine move saw Salah and Firmino interchange before Wijnaldum picked up the ball on the edge of the box, sending a left-foot drive just wide. Salah then missed a glorious chance to put the game beyond Brighton two minutes from time. Substitute James Milner's drilled cross found the Egyptian who somehow put wide from six yards. But Brighton could not find a leveller in the closing stages as Liverpool went seven points clear at the top. BRIGHTON: Button; Montoya, Duffy, Dunk, Bong; Stephens, Propper, Gross; March, Murray, Locadia. Subs: Steele, Bruno, Kayal (Gross, 79), Andone (Andone, 65), Knockaert (March, 65), Balogun, Sanders. LIVERPOOL: Alisson; Alexander-Arnold, Van Dijk, Robertson; Wijnaldum, Henderson, Shaqiri; Mane, Firmino, Salah. Subs: Mignolet, Milner (Shaqiri, 72), Keita (Mane, 90), Moreno, Origi, Matip, Camacho.